Pressidium Review 2019 - (hint, we LOVE them)! As a web agency, we use/test a LOT of hosting providers to scale both our clients and our many many side-projects (we like to experiment). Having done this for quite a few years now, we've used, analysed, and reviewed a lot of web hosts... these are our findings. In a nutshell, we LOVE Pressidium. In fact, this very site is hosted on Pressidium! They offer extremely reliable and secure WordPress hosting, have lightning fast data centers all over the world (+ an integrated CDN on the higher plans for max speeds), AND they’re cheaper than WP Engine. 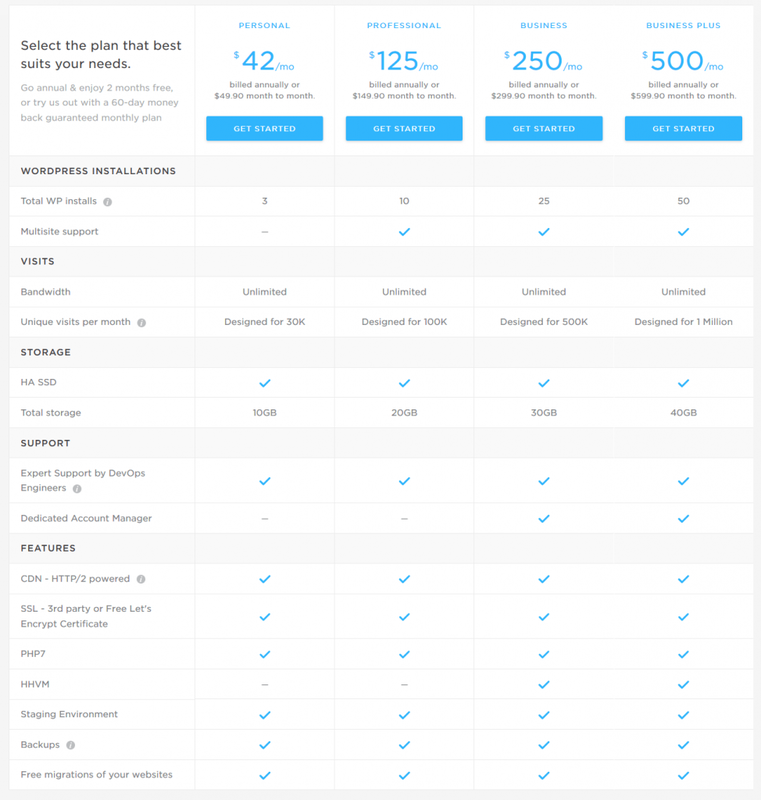 Affordable starter plan: Compared to other managed WP hosts with similar advanced features, they’re the cheapest around. Great Support: They’re here for you 24/7/365, expert WordPress support! Global reach: They have data centres all over the world, and have a blazing fast integrated CDN that makes going global super easy. Security: Managed auto-updates, malware monitoring and auto-removal, free malware removal, bad-bots filtering, free SSL certificates, and more… it’s a very impressive setup! Honestly, they’re a no-brainer in our book. Their cheapest plan (the Micro plan) starts at only $21/mo (WP Engine start at $35 btw). Pressidium was founded in February 28, 2013 by Andrew Georges, John Andriopoulos, Filip Slavik, and Giannis Zachariadis. They have four main data center regions in North America, Europe, Oceania, and Asia Pacific. Plus, they have 22 strategic edge locations around the world. They specialize in Managed WordPress Hosting services on Enterprise Architecture. The company prides itself in catering to a large customer base including Fortune 500 companies. Some of their clients include Fujitsu, Transifex, Modern Retail, 6 Yards, and Cornell University. Kevin Ohashi, the founder of Review Signal has given Pressidium the Top Tier WordPress Hosting Performance Award. This was in 2015 and 2016. The second cheapest plan is called Personal and costs USD 42.00 per month if billed annually (the cheapest one is the Micro plan, but we’ll focus on the Personal plan as it includes their CDN setup). If you want to pay on a month-to-month basis, it will cost you USD 49.90 per month. The said package allows you a maximum of 3 WordPress installs. If you want one extra WordPress install, you have to pay USD 14.90 per month for it. Multisite support is not included in the package. Bandwidth is unlimited. This means you don’t get charged extra for a more than usual amount of traffic. However, according to Pressidium, the Personal package is designed for 30,000 unique visits per month. Thus, server resources are just limited to about 30,000 monthly unique visits. You are given a free Let’s Encrypt Certificate. This means you can secure the sensitive information handled by your website. This helps to boost search engines rankings as well. FYI, Google favors secure websites (HTTPS) over non-secure ones (HTTP). If your website is hosted in another web hosting company, you are provided with a free migration of your website. Once you sign up, you can instantly schedule a migration. You simply have to open a support ticket. Pressidium’s team will do everything afterwards. Security of your hosting account is taken seriously by Pressidium. You get managed auto-updates, malware monitoring, and malware removal. You have a fully locked-down environment and you get to enjoy bad-bots filtering. Backups are done daily and automatically. You can create your own backups too. This helps you in cases wherein your website faces seriously complicated issues. If these issues cannot be fixed, you can simply restore the backup (a point when your website was still functional). CDN – This allows you to store website data as cache in multiple geographical locations. Thus, even website visitors far from your data center will experience blazing page loading speeds. They are simply served with the cached data stored in a location near to them. PHP 7 – This is an upgrade to PHP 5.6, making it faster than the said version. Applications also run faster with PHP 7 compared to PHP 5.6. HA SSD Storage – This means High Availability Solid-State Drives. These type of storage drives are faster compared to traditional mechanical drives. Thus, data is delivered faster resulting to quick loading speeds. Dynamic Load Balancing – This refers to distributing workloads across various computing resources to avoid overload of a single resource, minimize response time, and optimize resource use. With optimal dynamic load balancing, your page loading speeds become faster since resources are not overloaded. This is mainly because workloads are spread out on multiple servers (or resources). Automatic Image Optimization – Image are automatically optimized by reducing its size. Thus, loading your images will take fewer resources which, in turn, leads to faster loading speeds. Your user dashboard has a variety of features as well. You can have manual and automatic backups and you can check usage and traffic analytics. The dashboard also displays invoice and billing history. It allows you to manage a variety of plugins all in one platform. Finally, you are given a risk-free 60-day money-back guarantee. However, it is not offered in annual plans. If you are not satisfied with their services, you can get a full refund whatever the reason may be. Ticket and email support are available 24/7/365 and you get to get help from expert DevOps engineers. The Knowledge Base contains guides on how to manage the products and services of Pressidium. It also contains guides on how to troubleshoot simple problems. A dedicated account manager is only available if you opt for the Business or Business Plus plans. The Cloud Status Page contains updates on the platform and services of Pressidium. Status updates include that of Firewalls, WebApp Firewalls, Load Balancers, Multilayer Caching, WordPress App Servers, Database Clusters, CDN, SFTP, Staging & Snapshots, Cloud Backups, Portal, and API. Pressidium offers multiple features to optimize the speed of your website. They use high availability solid-state drives (HA SSD) which are faster than traditional mechanical drives. They also implement dynamic load balancing to avoid overworking resources and to allocate load to multiple resources which leads to optimal loading speeds. Other speed optimization features include multilayer adaptive caching, content delivery networks (CDNs), support of PHP 7, automatic image optimization, and choice of data center locations. Pressidium delivers websites that perform excellently–these websites rarely experience downtimes. Sites powered by Pressidium have an uptime rate higher than that of the average. They live up to their promise of super service to their customers by providing websites that perform well. You are given free Let’s Encrypt SSL Certificates. These are used to make your site more secure thus protecting the sensitive information contained within your site. It helps in boosting your rankings in search engines as well. Google loves secure sites over non-secure ones. Automatic daily backups are done on your site. This helps secure your site in cases where problems cannot be fixed. You can instantly restore your site using the backup–back to a point in time when your website is still working. Pressidium does not believe in vendor lock-ins. You can make a cancellation of your subscription anytime you want to. You are given a risk-free 60-day money-back guarantee. If you’re not satisfied with their products and services, you can always get a refund.